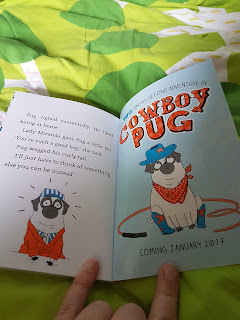 Is this really my life....: Captain Pug the cutest story I've read. My little light reading has turned into me being obsessed with the book that I've finally managed to start reading. From the second I started reading the bright orange, blue and white pictures drew me into the story. All the colors throughout the book are these 3 bright colors and fantastically drawn. The main character is a Pug named Pug which is Haystacks favourite breed. With the googly eyes that seem to watch your every movement right down to the curly tail he just loves them. The book follows the life of a rich Pug who has his own wardrobe. (I'm in awe as I wish I could put hats and ties on my Lab, yes I realise that it's a book but a lady can dream). he boating lake to ending up in a much bigger pond the story is full of giggles especially as Pug is afraid of water. Pugs owner Lady Miranda is a young lady who knows what she wants and when she wants it. When I was younger I wished I'd have servants but alas I only had an older brother. (It's all good I have nephews now ). TJ and I have both enjoyed reading this book and haven't wanted to put it down. In fact I didn't even when TJ fell asleep! Bad mommy, but I was enjoying it too much.